Fixed star Mirzam is a blue-white star in the left fore-leg of Canis Major, the Greater Dog. In Chinese, this star is called 軍市一 Jūn Shì yī (A Military City) , or Keun She, (The Soldiers Market) . 1. Star Names, Their Lore and Meaning, Richard Hinckley Allen, 1889, p.129, 130. 2. Constellation of Words – Mirzam, Anne Wright. 4. Fixed Stars and Constellations in Astrology, Vivian E. Robson, 1923, p.34. 5. Manilius, Astronomica, 1st century AD, book 1, p.34-37. 6. The Witness of the Stars, E. W. Bullinger, 34. 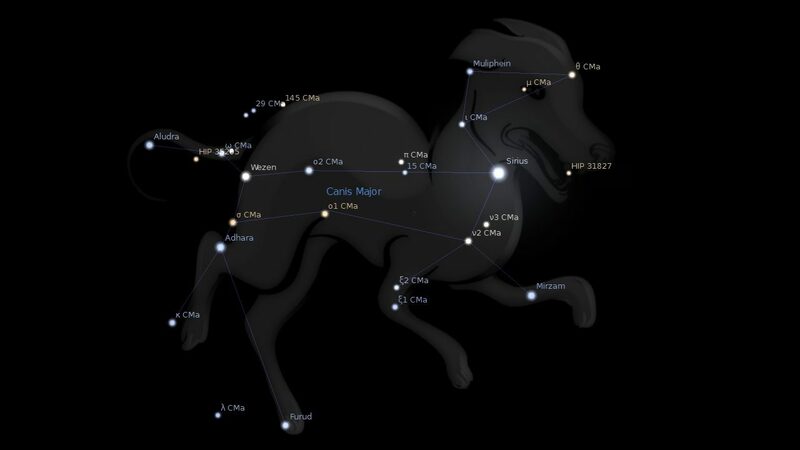 Canis Major (the Dog).